What are Schools For? (10 Dec 2010, London) was the launch event for the UK’s Whole Education network, whose partners number many of the country’s most dynamic organisations seeking to effect educational transformation. I went along wearing two hats: (i) as an Open Univ. researcher I’m tracking the shifting learning landscape with a particular interest in software tools for sensemaking in educational and workplace contexts, with a project in the Learning Futures programme for schools; (ii) as Chair of Governors at Bushfield School. 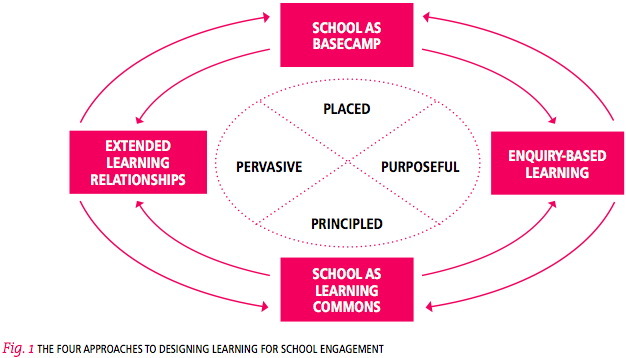 I wrote a report to seed strategic discussion with school governors, but I’m adding it to my Future Schools blog posts, since it may be of wider interest to other schools, but also post-secondary educational institutions, and indeed, workplace learning: this is about skills and habits of mind for learning and life at large. “A gulf has opened up between what education systems provide and what children and young people need. Our schools and colleges rightly try to ensure that young people are literate, numerate and gain academic qualifications. But the emphasis on testing and passing exams often squeezes out other skills and qualities that are just as vital in today’s world. What are our common beliefs? The event (Press Release) was a series of keynotes, breakout sessions led by W.E.’s partner organisations, partner exhibition stands, and a closing plenary discussion. Dr. John Dunford, Chair of Whole Education: Highlighting the current opportunities for those involved with education. Dr. Anthony Seldon, Master of Wellington College: “Why we need an end to factory schools”. I’m still digesting the many ideas. This was an inspiring mix of highly committed people who are used to thinking out of the box and blazing new trails in education. We are already in good shape, but there’s so much more to do. The work we have been doing over the last 4 years has clearly built on Bushfield’s many strengths, and tackled its weaknesses: as TLO concluded from their audit, we have been embedding BLP faster than most. BLP are W.E. partners, as are ViTaL Partnerships Ltd, who have developed complementary tools for tracking and strengthening Learning Power in individual pupils and cohorts, which we are about to investigate. Another W.E. partner is Open Futures [www.openfutures.com] who focus on linking learning with life skills such as cooking or filming. We concluded that we are already doing many of the things they champion, although they will of course have potentially useful resources. But the W.E. movement makes clear the many other opportunities to reimagine school, when the world is changing faster than ever. The question is which if any might we pursue in a clear-headed, strategic manner, which take into account the demands we already make on staff. Pupil voice and leadership. Learning to Lead [www.learningtolead.org.uk] were championing greater pupil voice and leadership in schools, by moving beyond a small pupil group of specially elected children, to encourage all pupils to form groups and engage in practical projects either within the school or wider community. They had examples from primary as well as secondary. This resonates with the last Ofsted’s recommendation that we engage more often with the Student Council and perhaps empower them with a budget to put to specific projects. Partnering to secure external grants. We had one conversation with people from a trust focused on creativity in schools. Their job is to resource schools with skilled staff who can boost creativity, but they need funds from e.g. government programmes. It was clear that if we built good relationships with such people, when a new funding call came out, we would be much more prepared to seize such opportunities and catalyse innovation. Is this something governors can help with, or should it be staff — or both? using Spaced Learning to accelerate information transmission, freeing time for other activity (Monkseaton, Whitley Bay).I’d anticipate that this challenge will get air time at Whole Education’s next series of events around the country: Whose Curriculum is it anyway? and that based on these, I hope that W.E. might consider setting up a one-stop-shop and exchange for discussing such innovations. Joined up schools. I attended a great session by the Head of Bedfordshire East Schools Trust (BEST) [www.best-schools.org.uk]. Without getting starry eyed, he gave numerous examples of the power you can get when schools work well together, both regarding what goes in school, and how they engage with community, LA, and other external agencies like social services. Imagine a secondary school inviting a middle school to lead the teaching of a particular subject because they recognise that their staff are actually better at it! We will take collective responsibility for the success of all children in BEST schools. BEST will be a powerful voice and one local accountable organisation delivering a commonly designed curriculum from 2+ to 19.